The concept of pressure and energy can be understood better through the example of pressure cooker. 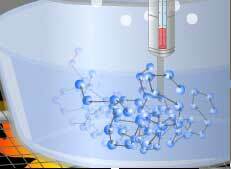 Pressure cooker animation gives an insight into the molecular level interplay of energies and forces . Also included are sections on design and advantages of pressure cooker. This kind of explanation using animation is the only one in the world. It is very useful for industry and schools. At macro level it gives an insight into structure and design of a pressure cooker, its parts and their description; its advantages, principle of working etc. At micro level it explains the concept of boiling and how molecule interact with each other to create "pressure". 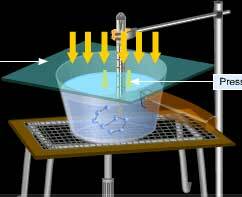 The mechanism of boiling in an open pan, closed pan and further explanation based on momentum. Bonds in water and how are they affected by energy. Effect of atmospheric pressure --- Collision of air molecules. What is happening inside it when water is heated ? Why does the temperature increase faster in a cooker than in an open pan? How does superheated steam ensure faster and better cooking ? Why do the H2O molecules that have broken free start rising to the top ? 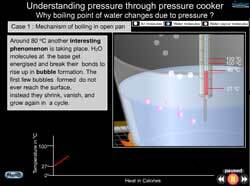 Why does boiling take place when vapour pressure = atmospheric pressure ? What has kinetic energy and collisions got to do with it ? 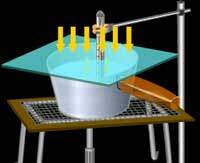 Does boiling take place only at the surface of liquid? How do air molecules exert pressure on the water vapour ? Do the bubbles formed in boiling at the base contain air ? Temperature - pressure relationship under constant volume. Generation of high pressure inside pressure cooker - complete explanation done on the basis of momentum, collisions, Newton second law of motion and conservation of momentum. Why pressure goes up when more gas is added to a closed container ? what would happen if the walls of a cooker are made up of thinner material ? why pressure cooker is a boon to those living at high altitudes? Why Boiling point decreases with an increase in altitude ? 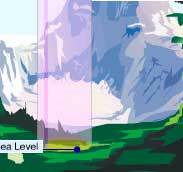 Why atmospheric pressure decreases with altitude ? what it has to do with gravity ? How can water boil at room temperature? Ans: Before collision the molecule of water is moving with velocity “V”, its momentum is mV, after collision it moves with a velocity “-V” ( due to motion in opposite direction). Change in momentum is final momentum - initial momentum = - mV – (mV) = - 2mV. Since the wall is at rest, momentum is transferred to the wall, by Newton’s second law of motion : F = mdv/dt = 2mV/dt , this is the force generated by one molecule on the wall. We have covered the force generated by a number of molecules in the animation. Ans: Well we do not see the role of oxygen in pressure-cooking except that it forms a major constituent of air used for producing pressure inside and helps in combustion. But oxygen has some role firstly at high altitudes, oxygen is less, hence pressure cooking plays a major role here. Ans: The heat loss can be given by the equation h1 –h2 = ( ½ ( v2.v2 – v1.v1) = Cp ( T1 – T2), where where h represents enthalpy of the fluid (which can be considered the energy available for heat transfer), v is the flow velocity in the x-direction, Cp is the effective heat capacity of the fluid, and T is the fluid temperature. We are unable to answer the second part of the question. Ans: Latent heat of vaporization usually increases as vacuum increases (pressure decreases). The difference in enthalpy of vapor and liquid at saturation temperature is defined as latent heat. Now, in general, when you decrease the pressure, enthalpy of both vapor and liquid decreases. However, the decrease in enthalpy of liquid is of larger magnitude than that of vapor. Therefore, the difference or the latent heat will increase as you decrease the pressure. Ans: You are correct in the sense it does not occur at room temperature when boiled under constant pressure, we had included the example at constant pressure only to highlight the fact that at vacuum one can boil at room temperature while under constant pressure, it takes much higher values of temperature. Ans: A servo is small automatic device that has an output shaft, large amounts of power is controlled by means of very small one by velocity/position feedback mechanism. The shaft travel distance is proportional to the amount of power applied to the motor. This shaft can be placed in specific angular positions by a coded signal sent to servo. A single unit consists of a brushless servomotor, servo amplifier and position controller .It is used in automated step-less control of pressure and flow rate. Ans: Hi, we are unable to source the chemical composition of the components of cooker like vessel, pressure valve, handle, lid, etc, as the sources for this information either broadly outline the material used in example 430 SS or aluminum used for outer body, silicone rubber material for gasket or are paid for example astm.org (for material standards) or manufactures themselves. Bureau of Indian standards might be able to help in this, as India is one of the major producers of pressure cooker. Ans: Aluminum or Stainless steel body with stainless steel in higher usage, food grade rubber gasket, Bakelite Handles with Stainless Steel handle body. Ans: From what we can gather from the site, this is a steam sprayer but not a pressure cooker. This model can be termed as a better and faster “ cooker” competing with a conventional oven but the effect of combined pressure and temperature in a pressure cooker cannot be matched by it in making curries and noodles. We are not sure about the oxygen thing. Ans: Pressure cooker largely operates with same efficiency and time economy everywhere, at higher altitude two factors affect it 1) Ambient Temperature : Since it is cooler, the time required for pressure cooker and cold water put in it to reach working temperatures is higher 2) Pressure : If the weighted gauge is preset cooking time has to be increased, otherwise a higher weight is necessary as the atmospheric pressure outside is lower a pre-set weight will lift up earlier. 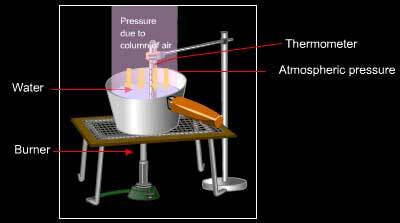 Ans: Boiling occurs when vapour pressure = atmospheric pressure, however in a cooker, the atmosphere is sealed and it is the steam that performs the restraining act on the molecules of water and prevent them from leaving liquid phase, since the steam is at higher pressure than atmospheric pressure hence water boils at 125 deg C or beyond. 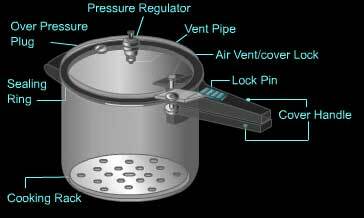 Ans: In an open vessel water boils when vapour pressure = atmospheric pressure, in a cooker steam is at higher pressure than atmospheric pressure hence water boils at 125 deg C or beyond. Thus it attains temperature higher than 100 deg C before boiling. A superheated steam all occurs, it has 8-10 times higher heat content than water. More heat content means faster cooking (or more heat to cook). Availability of high quantity of super heated steam and high temperature water leads to faster cooking. Ans: Thanks for your request, generally, we try to complete a topic from every point of view and the research and development takes about 4-5 months per animation. We have already developed it until its composition stage but its regular use say for breathing or in tires and industrial use (in pneumatic applications) and its separation (incl. Cryogenic air separation) is taking a considerable time, we are targeting June’06 release. Please do check our site again for new releases.